This is the very famous Taiji poem and is something that every Taiji practitioner should know as it helps us to understand the standard of our Taijiquan. 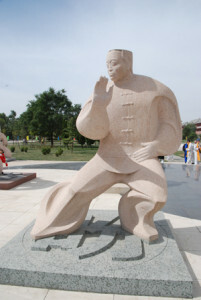 It also tells us that to be good at practising Taijiquan we cannot only know the forms. We need to go deeper to develop our understanding of Taijiquan whether we study Chen, Yang, Wu or any other style. We need to practice regularly until we feel comfortable and our movements flow smoothly. Then we need to practice Tui Shou 推手 to find out how we use and receive energy or strength correctly. Beginners are always too hard, too stiff and uncoordinated, but this is something we all have to go through. We need to learn how to relax, learn how to sink our Qi to our Dantian and put our weight on our legs. This all takes practice.